The uptime of your site is important to you. You can be sure that it's even more important to us. That's why we value the integrity of our network and operate in one of the world's top datacenters. Redundant power generators, proven upstream providers, security and safety are just some of the features of our datacenters. Decide for yourself, isn't this where you'd like to have your websites hosted? Power Outage = Website Outage. 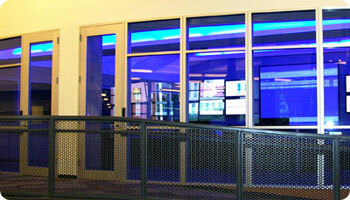 If any of our data centers were to experience a power disruption for any reason, you're covered. That's because we have a complete power management system, including backup generators, in the unlikely event that normal power supplies fail. Servers within our data centers are fed power through an Uninterrupted Power Supply (UPS) that takes raw power from a utility to control, modulate, and supply it power to thousands of individual servers. 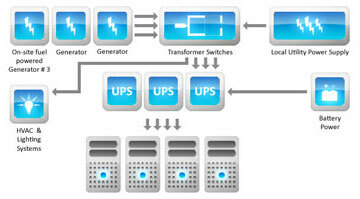 (See diagram) The UPS prevents power surges or local brown outs from affecting server performance. 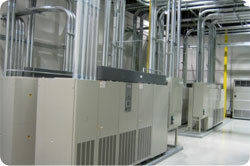 Power typically flows from the local utility to our UPS system to power our servers and the building's lighting, heating, ventilation and air conditioning systems. In the unlikely event that the local utility power supply is disrupted, our N+1 generator architecture assures that backup generators kick in automatically. Our network speed and capacity eliminate bandwidth traffic jams and roadblocks to assure high volume, instantaneous response for hosted applications. By using multiple Tier 1 telecom providers and direct Internet connections, we bypass transit networks and shorten the network path between your websites and your visitors. The result is lower latency, maximum speed and unsurpassed reliability. In short, we provide you with connectivity, bandwidth and stability you simply can't find anywhere else. We have taken special care in building one of the best network routing and switching infrastructures in the industry. Designed without single points of failure, our network operates at full redundancy across multiple layers that contain redundant core routers, core distribution switches and carrier diversity. We offer 24x7x365 redundant monitoring capabilities from server-oriented response centers in each city, as well as centralized network monitoring from the Network Operations Center (NOC). The NOC has Cisco-certified technical support on duty at all times to rapidly respond to any network problem. In the event of some sort of natural disaster that could affect our NOC, the NOC is able to transfer operations to another location before the disaster actually manifests itself. We leverage state-of-the-art network monitoring software combined with highly defined monitoring and escalation procedures to ensure the highest standards for security, reliability, performance and systems availability. Our redundant network cores in all of our data centers: if a router or high-level network appliance goes down for any reason, there is no loss of service. 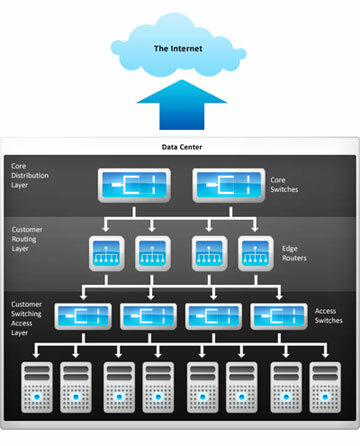 The multiple cross-connects between our data centers: if any multi-gigabit connection becomes unavailable, traffic automatically re-routes to the remaining connections. No datacenter has less than two connections. The speed and performance of our network routes: analyzing and optimizing when necessary. And, its all backed by a 3rd party certification process. Copyright © 2003-2016 Arvixe, LLC. All trademarks are property of their legal owner.